(NaturalNews) For only "pennies a day," any greenhouse owner can produce CO2 to help increase plant yields in their greenhouses. That's the message on CO2 generators sold by greenhouse supply companies across the United States and Canada. "1,500 ppm [of carbon dioxide] can be achieved... these generators automatically provide the carbon dioxide needed to meet maximum growing potential for only pennies a day," the ad says. CO2 generators "improve plant quality" and "increase production." They're made in the USA and run on propane or natural gas, turning fossil fuels into carbon dioxide. Why does this work to radically improve plant growth, health and yields? Because -- are you ready for the truth? -- CO2 is a plant NUTRIENT. Nope, it's not a pollutant that threatens human civilization as has been ridiculously claimed by global warming doomsday pushers. CO2 actually increases plant yields, accelerates "re-greening" and improves reforestation of the planet. And while today's atmosphere contains only 400 ppm of carbon dioxide, CO2 generators can help raise that level to 1500 ppm inside greenhouses, thereby accelerating plant growth and food production. Is CO2 is so bad for the planet, why do greenhouses pay to produce it? If CO2 was so terrible for the planet, then installing a CO2 generator in a greenhouse would kill the plants. But scientists and even governments actually recommend supplementing CO2 in greenhouses in order to boost plant growth and food production. "The benefits of carbon dioxide supplementation on plant growth and production within the greenhouse environment have been well understood for many years," says the Ontario Ministry of Agriculture and Food. 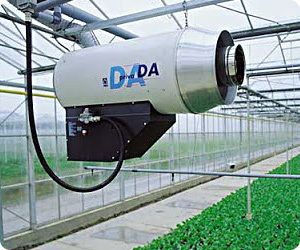 "CO2 increases productivity through improved plant growth and vigour. Some ways in which productivity is increased by CO2 include earlier flowering, higher fruit yields, reduced bud abortion in roses, improved stem strength and flower size. Growers should regard CO2 as a nutrient... increasing the CO2 level to 1,000 ppm will increase the photosynthesis by about 50% over ambient CO2 levels." In fact, as recent scientific studies have shown, the slight rise in CO2 levels of the atmosphere has actually helped re-green deserts and arid areas, accelerating the growth of trees, shrubs and grasses which produce the oxygen human needs to breathe. As a society interested in reforestation, expanding the diversity of plant life, nourishing trees and re-greening deserts, we should no longer tolerate anyone engaged in hate speech against Mother Nature and CO2. Those who attempt to demonize this critical nutrient for the planet are engaged in a kind of hate-motivated racism against plants. If it's not okay to condemn someone for being black, why is it okay for people like Al Gore to engage in endless hate speech against all the living beings that are green? Besides, all those people who keep sounding the alarm on CO2 are being too negative all the time. Nobody spews more doom and gloom than Al Gore and the global warming crowd who paint apocalyptic pictures of Earth's future if we all don't start paying carbon taxes to the super rich. Stop being so negative! "CO2 is a nutrient for forests." "CO2 is produced by ocean life." "CO2 brings balance to the global ecosystem." "CO2 is to plants as oxygen is to humans." "CO2 can help transform barren deserts into sustainable forests." Perhaps by staying positive, the global warming fearmongers and doom-and-gloomers can calm down, take a few breaths (with extra CO2) and recognize that what's good for plants is good for the planet. In fact, I'm going to hyperventilate after writing this article just to generate a little extra CO2 for the world. It's my gift to Al Gore. The No. 1 criticism of this story by the brainwashed hoards of Al Gore cult worshippers will be that I must have been paid big bucks by the coal industry to write this article. Don't be ridiculous. I'm the record -- for at least a decade -- having exhaustively condemned the burning of fossil fuels. Even though the CO2 they release into the atmosphere is actually a nutrient, they release many other pollutants such as sulfur and mercury (from coal). Scrubbers in the USA make U.S. coal plants the cleanest in the world, but China's coal plants are truly sickening pollution factories. I also believe it's time to get humanity off the petrochemical habit and onto something cleaner and more renewable such as low-energy nuclear reactions (LENR), formerly called "cold fusion." Recent analysis has confirmed, yet again, that cold fusion is real and practical. Cold fusion could be harnessed and used in place of coal to heat large quantities of water that drive steam turbines which generate electricity. In time, all of America's coal power plants could be switched over to cold fusion. Similarly, if improved battery technology comes along, gasoline-powered vehicles could be switched over to electricity, and if that electricity is powered by cold fusion, then it's clean all the way through the energy supply chain. Fossil fuels are dirty business: they're dirty to extract from the ground, dirty to transport and dirty to burn. But the CO2 they produce is not a pollutant; it's a nutrient that's desperately needed by trees, grasses and shrubs all around the world. So while there are lots of reasons to oppose the burning of fossil fuels around our planet, CO2 is not legitimately one of them. If all this talk makes you hyperventilate, then feel free to experience a hefty dose of self-inflicted guilt that you can alleviate only by sending all your money to Al Gore for all the carbon dioxide you're generating.